From the website of the Auraria Church of the Almighty God, as this historic church is now known: Auraria Church of the Almighty God was first known as Auraria Methodist Church. The first written records date back to 1846. 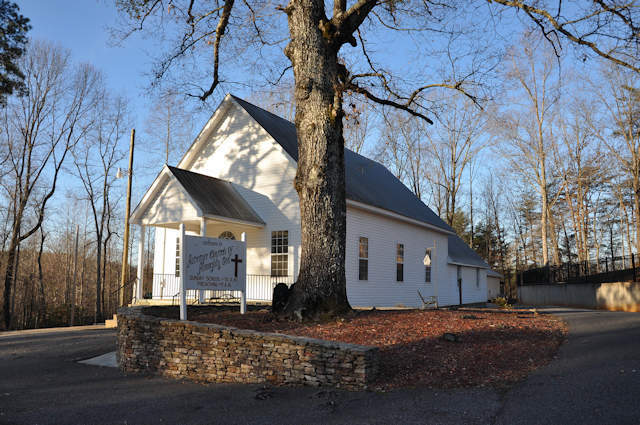 From 1861 to 1873 it was an independent church with no known residential pastor. In 1873 it became a circuit church with several itinerant pastors. Thanks to many old-timers and lots of hard work, the church still stands. The church’s original appearance and many of the old traditions have been preserved as much as possible. In reading this, I assume the church dates to the 1840s but cannot confirm it at this time.